Toronto’s Esprit Orchestra’s 2018-2019 concert season will begin with an intergalactic journey, and end with a grand slam. Founding Music Director & Conductor, Alex Pauk will lead the orchestra and audience through a program of music by exceptional composers such as Unsuk Chin, R. Murray Schafer, Maki Ishii, Alexina Louie, among others. The season also includes eight World Premieres, all by emerging composers. The orchestra will be joined by extraordinary soloists throughout the season: cellist Joseph Johnson, Inuit throat singers Evie Mark and Akinisie Sivuarapik, saxophonist Wallace Halladay, and percussionist Ryan Scott . 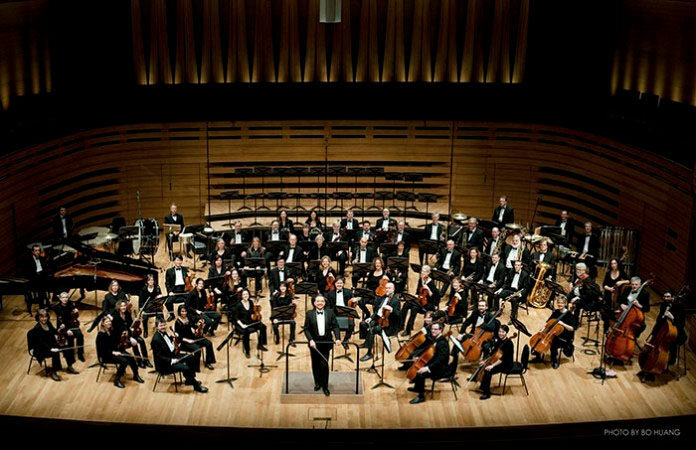 All regular season concerts take place at 8:00 pm at Koerner Hall, and are preceded by engaging pre-concert talks with the composers and musicians. Concert dates are: October 24, 2018; November 28, 2018; January 20, 2019; March 24, 2019. In addition, Esprit will be relaunching its New Wave Young Composers Festival this season; the New Wave Reprise concert will take place on April 5, 2019, and will feature six World Premieres by emerging Canadian composers. full orchestra. Lastly, Sinfonia by Dutch composer Tristan Keuris is simply a work of utmost charm and pleasurable musical invention. The November concert will include an unconventional instrument in the orchestra – a snowmobile! On Wednesday November 28, 2019, North/White will feature R. Murray Schafer’ s piece of the same title, which, while depicting Arctic beauty, also portrays the environmental destruction of the Canadian North by pipelines, highways, and machinery. Schafer writes, “I decided to place a snowmobile in the percussion section as a symbol of noise and pollution generated by technology”. Accompanying Schafer’s work on the program is composer Alexina Louie ’s own musical reflection on Canada’s Arctic. In her piece, Take the Dog Sled, performed by Inuit throat singers, Evie Mark and Akinisie Sivuarapik, Louie captures the joy, tenderness and energy of life in the North. The piece touches upon the humour of the Inuit and the mystical qualities of the surrounding lands. Unconventional instruments are featured in Take the Dog Sled too, such as a marimba constructed from varying sizes of glass bottles. A pair of hard, resonant stones begin the piece in the percussion section. The composer opted for these in order to ensure the piece could be performed in remote areas without the barrier of flying in cumbersome or delicate instruments on small propeller planes. Finally, Icelandic composer Anna Thorvaldsdottir’s Dreaming is a rich, meditative piece of music; a mysterious shifting landscape, bringing time to a halt – like a dream. Constellations on January 20, 2019, is both the finale of the Royal Conservatory’s 21C Music Festival, and the opening concert in the University of Toronto New Music Festival. The program features Toshio Hosokawa’s Concerto for Saxophone and Orchestra, to be performed by guest artist, saxophonist Wallace Halladay. Hosokawa is the Roger D. Moore Distinguished Visitor for Composition for the university’s festival. Canadian emerging composer Christopher Goddard returns to the Esprit stage for the second year in a row with the World Premiere of his commissioned work, Les tringles des sistres tintaient, an energetic re-imagining of a spellbinding gypsy song that opens act two of Bizet’s Carmen. Claude Vivier’s Orion takes listeners on a journey to the stars with his reverent cosmic soundscape. The piece is a vivid expression of Vivier’s musical state of ‘eternal homecoming’. Also on the Constellations program is a recent piece by emerging composer Alison Yun-Fei Jiang, entitled River Memory. A new commission by Jiang will also appear on the New Wave Reprise concert program, detailed below. Grand Slam!, Esprit’s 2018-2019 season finale will surely “knock it out of the park” on March 24, 2019. The orchestra will perform the World Premiere of Toronto-based composer Christopher Thornborrow’s new work, Trompe l’oeil . In keeping with Esprit’s commitment to fostering lasting relationships with composers’ work through repeat performances, Unsuk Chin is featured for the second time this season. Principal cellist of the Toronto Symphony Orchestra, Joseph Johnson returns to the Esprit stage as guest artist to perform Chin’s Cello Concerto. This work explores the cello’s lyric qualities; it will cast a spell over listeners with its floating, dream-like sequences, flickering impulses of musical lightening, frenetic drive and long-spun melodies. Finally, after the hit performance of Maki Ishii’s Mono-Prism by taiko drummers during last season’s finale concert, Ishii’s music will reappear with another impressive percussion performance by none other than Esprit’s principal percussionist, Ryan Scott. Ishii’s powerful Afro Concerto blends cultural inflections and is a spectacular musical blast to end the season. as keynote speaker, offering his insight into the changing landscape of contemporary classical music. All New Wave tickets will go through the Esprit office; pricing and further details to come. All regular season subscribers receive free admission to New Wave Reprise.